If ever Austin charities instituted a league of competitive galas — and Lord help us if they did — Ballet Austin’s annual Fete would rank in the Top 5 every year. 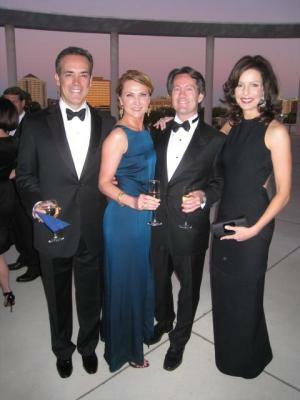 For the 2008 iteration, the Fete did not match the historic singularity of the Long Center opening, nor the international celebrity tally of the Nobelity Project or Roddick Foundation fundraisers. It wasn’t attended by as many political stars as benefits for health and human services, especially those dedicated to protecting women and children, nor as many sports figures flashing burnt orange as one sees at University of Texas events, nor the Hollywood glamour of the Texas Film Hall of Fame parties. Instead, the Fete relies on one distinction: Class. Ascending the stairs to the Long Center plaza, one was met immediately with refreshments and warm welcomes from the many hosts. Eveningwear looked lustrous, stylish, never gaudy. Befitting the Frank Sinatra theme, a saloon singer crooned, while guests lingered too long, deep in conversation and glittery-eyed over the framed Austin skyline on a serene October night. On to the dining tent, where tables were spaced in a civilized manner and table-hopping was encouraged. Each station was laden with scented floral arrangements, but the one small element that made Maria and Eric Groten’s hosting efforts bewitching were the faceted, crystalline boughs that hung over most tables, mesmerizing the guests. Talk turned to politics — don’t imagine that everyone agreed; it is Austin — at our table, which included Kate and Robert Hersch, who did such a good job with the Film Society gala, Austin Ventures foursome Carla and Jack McDonald, Julie and John Thornton and jaunty Brilliant publisher Lance Avery Morgan. Others nearby included Admiral Bobby and wife Nancy Inman, immaculately dressed Karen Landa and Dale Dewey, UT Fine Arts Dean Doug Dempster and his fundraising sidekick, Sondra Lomax, all-round arts philanthropists Sarah and Ernest Butler, place-namers Teresa and Joe Long, power pair Elizabeth Christian and Bruce Todd, Endeavor newsmakers Amy and Kirk Rudy, inveterately social Joan and Ben Bentzin, as well as cool redheads Melanie and Ben Barnes. The food, including intensely marinated hangar steak, came in modest portions, so nobody felt overstuffed by the time Ballet Austin’s dancers performed in the Dell Hall one selection from the weekend’s season-opening fare. Dance icon Suzanne Farrell was introduced by artistic director Stephen Mills, but she did not speak. During Twyla Tharp’s “Nine Sinatra Songs,” we mostly noticed the newcomers, who add strength and panache to the established troupe. Rare image: Your columnist with hostess Maria Groten.